Despite the fact that it is summer and the heat has a way of killing our enthusiasm to turn on the stove, I did it anyway; I made corn soup. And what a delight! 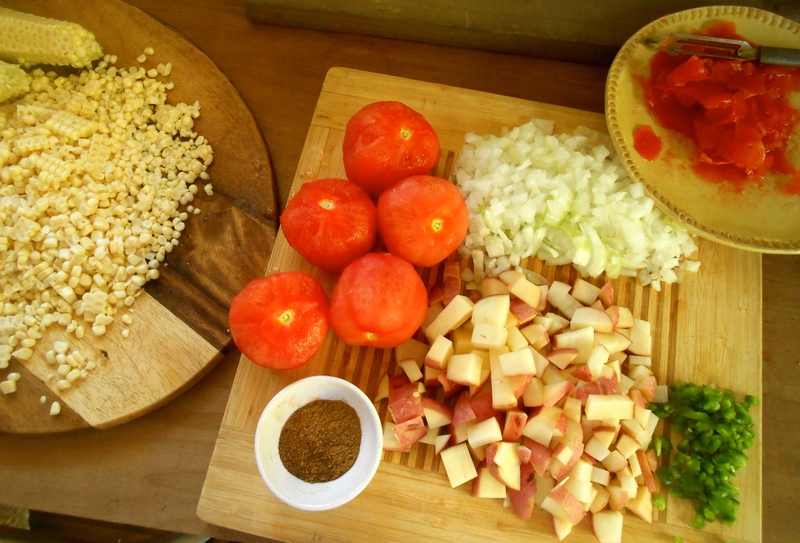 Sweet corn and tomatoes are the quintessential tastes of summer. Adding a nice plump jalapeño to the soup pot created a softly spiced bowl of summer goodness. After shucking your corn and before cutting kernels for a soup you want to eliminate as much silk as possible. A helpful little technique in removing the silk from your corn is to dampen a paper towel and wipe the ear from tip to stem to capture any clinging strands. A few silk strands left on an ear of corn that’s destined for the grill is no big deal, as they will be quickly singed off. On the other hand, it is not very pleasant to come across a silk string in your soup. Recipe slightly adapted from Fine Cooking Magazine. 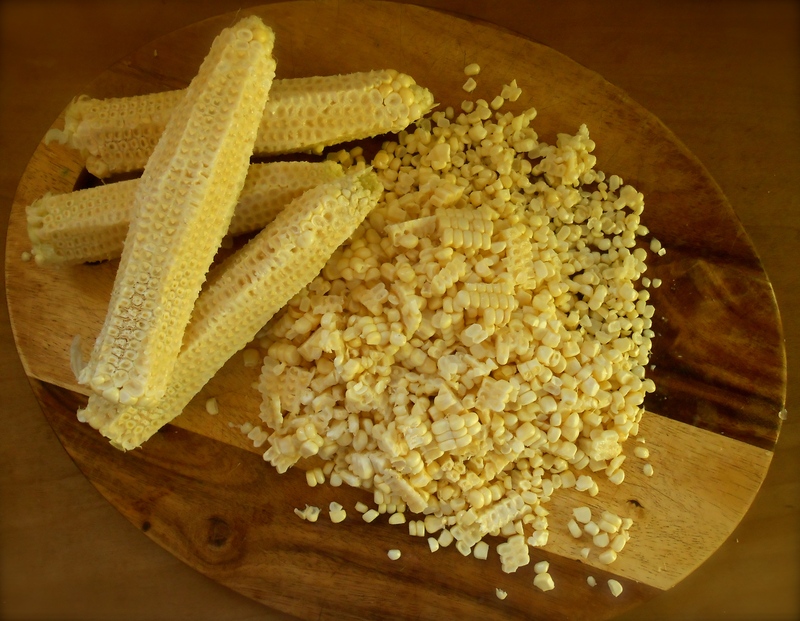 Hold each ear of corn with the flat end in a large bowl and use a sharp knife to cut down the cob, removing the kernels. You should have about 2 cups of kernels. Reserve the cobs. In a heavy based stockpot, heat the olive oil, then add the onions and 1/2 teaspoon salt. Cook over low heat until the onions are soft, about 10 minutes. Add the cumin, coriander, chili powder, jalapeños, and garlic to the pot and sauté until the jalapeños are slightly softened, 2 to 3 minutes. Add the tomatoes and cook until they release their juices and soften, about 10 minutes. Add the potatoes and reserved corncobs, and 3 cups of water. Cover and simmer until the potatoes are tender but still firm, 8 to 10 minutes. Add the corn kernels and cook for 1 minutes more, until the kernels are heated through. Remove the pot from the stove. Remove the corncobs. Using an immersion blender, blend the soup until about half of it is puréed, or put half of the soup in a blender and purée it, and then combine. Add the half and half and cheese and return the soup to the stove. Heat over low heat until the cheese is melted; do not boil. Taste and season with more salt as needed. Ladle into soup bowls and serve right away. Save the corncobs! Simmering the corncobs in the soup intensifies the sweet corn flavor. Serve topped with red chili flakes and cilantro flowers. And don’t forget the glass of vinho verde. I love chunky corn soup. I think I prefer it this way rather than blended completely smooth. And yes, that one jalapeño (seeds removed) gave it a perfect amount of heat. Thank you Deena! Oh does this look lovely. 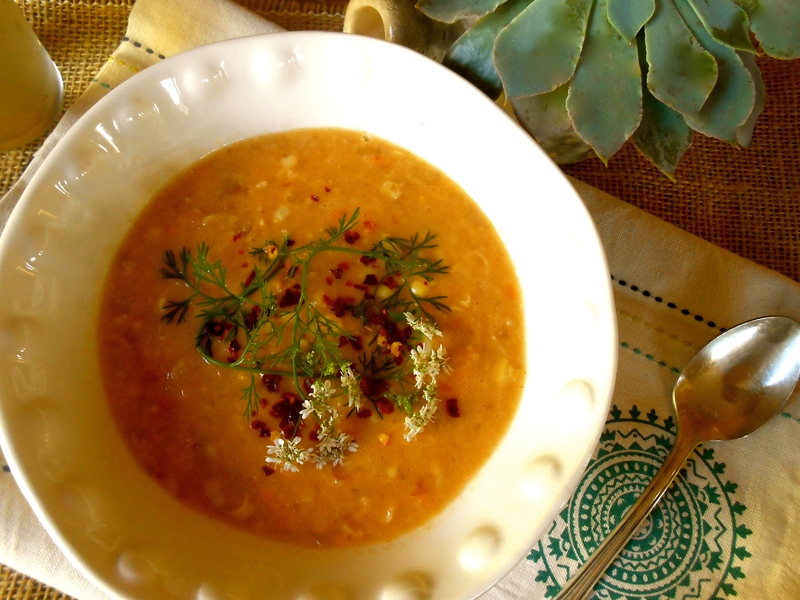 You know, I never pay attention to the seasons…and for this corn soup, I would definitely “look the other way” when it comes to soup and summer! As a matter of fact, I have a pot of chili on the stove as I’m typing this! Hi Prudy! You’re online right now! :) I’m with you about not paying attention to the seasons. And boy does chili sound good right now. Must smell wonderful in your home. Thank you for your ever so kind comments. Have a good weekend! Delicious! 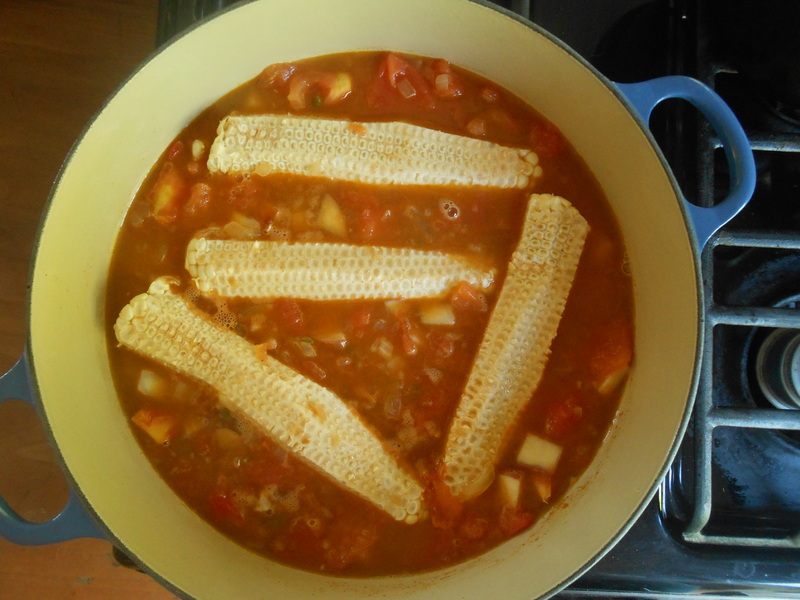 I always add the cobs to any soup containing corn, you’re absolutely right, it does intensify the corniness(?). I’ve bookmarked this until I can find some corn! Thanks Seana, another gem.. Thank you Sandra. I like your word “corniness”! Ha! This leftover soup made a really good dip for tortilla chips. Sort of like a corn salsa. Thank you for bookmarking…I’m going make your zucchini soup for sure. Sounds heavenly. Using the cobs is brilliant! I always feel like I’m wasting something when I throw them out. We’ve been eating a lot of corn & tomatoes this week, thanks for this addition to the repertoire. p.s. I miss you on Fridays! Miss you too! It has been a very nice summer so far. I read about your wonderful trip, what a nice experience with your boys. It would be nice to see you his summer…Queen Anne farmer’s market, or how about Columbia City! Yes! Let’s do that in August! As yet this summer (what summer!) I haven’t had sweetcorn, or corn on the cob as it’s called here. And I don’t think I’ve ever had sweetcorn soup! Not even sweetcorn in a soup. Huh. Maybe that should be rectified – ASAP. Especially as I love corn, butter and black pepper. We’ve had two days of heavy storms. Still waiting! 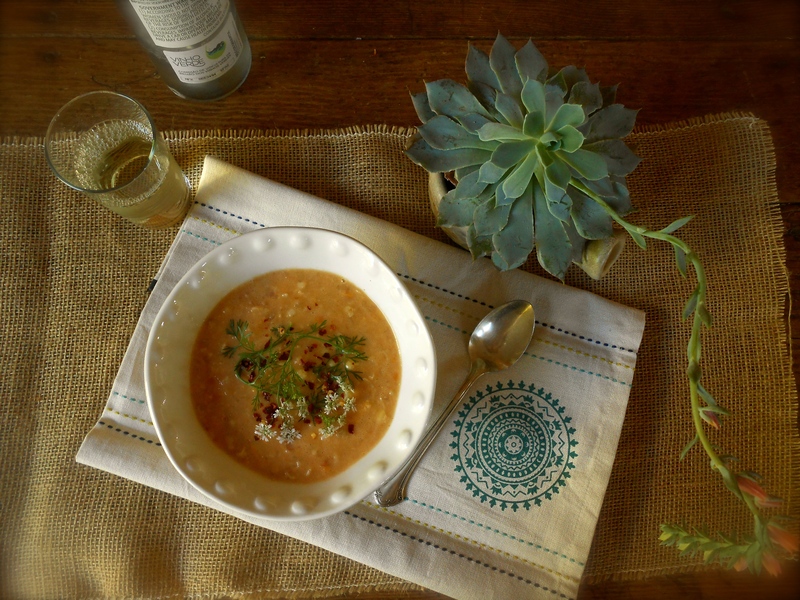 I love this soup, this is one of my summer favorites. Like the addition of a little heat in this. Very nice! Thank you Cheri. I made a fabulous corn soup last year when it was in season and I think making corn soup has become one of my summer favorites as well. So fresh and delicious. I know you shy away from the stove in the summertime. I would too if we had the sweltering heat you get in your place! If you do get a little break from the heat and would like to cook up some corn on the cob soup you wouldn’t be disappointed. Our high has been 82F this week…that’s hot for us! In love that you utilize all of the corn! This is a fabulous dish. :-) We love sweet, summer corn around here. Hi Shanna! It’s great to hear from you! Isn’t sweet summer corn on the cob fabulous. I love grilling it and adding spices and Mexican cheese. Never tire of it. :) Hope you are staying cool this summer! Ohhhh, queso fresco, garlic, cilantro and butter! Yum! I really like corn soup. I don’t think I’ve ever added tomatoes to mine, but in that recipe it really makes sense. Thanks for the idea! I have some tomatoes ripening in the garden, maybe this soup is their destiny! oh so delicious! !I can’t wait to try this out. Ha! You are clever. Please give me feedback if you make it! Love to hear your opinion. Delicious! I have made now about 3 different batches and am hooked on corn chowder. Mmmmm, I might have to make this. I love the combination of seasonings with the corn. And I’m with you on chunky corn soup. Enjoy the heat! Ha! I was reading your post at the same time. :) Awww, the heat. It’s finally upon us. I know! It might be 87 degrees today, possibly hotter! Well, I hope so. :) believe me…there are days when the kitchen is closed! This looks like a wonderful summer soup! I love using corn in recipes during the summer! Thank you Nancy. The soup was so good we finished it off in one sitting. I’ll have to double the recipe next time for lunch the next day. I’m reading this at 5:42pm with no dinner in sight and no plan (yet) for dinner. Your photographs made my mouth water. Then I started reading the comments and got to Prudy’s chili. Now I’m heading to my empty fridge to figure out what on earth to make for dinner. Once again how I wish you were my neighbour… we could take turns. I love everything you make. What a lovely summer soup. Definitely worth heating up the kitchen a bit. Fabulous soup! I love your ingredients! Most corn soups are just about corn and cream. Great that you added tomatoes. Thank you Mimi! It’s true, it seems most corn soup do have cream. The potatoes thickened it up quite nicely. The soup really filled you up, but not too rich, and oh so delicious! I must put this on my “to-cook” list for when I’m back into the cooking world. This has all the flavors I love. I thought it was a great tip! The soup is so wonderful. It is my new favorite way to enjoy corn. whoa Seana! we are loving corn this summer and this looks wonderful– love all the flavoring ingregredients on the list. thanks for the tip for removing the corn silk! Yep, corn & butter– match made in heaven! beautiful pot of soup, Seana. I don’t always enjoy corn, but I do consistently enjoy it in soup for some reason. I like it in Asian soups and soups like these, when it is the quintessential taste of summer. Never knew to throw the corncobs in, but I’ll remember it now! You are currently reading summertime corn soup at COTTAGE GROVE HOUSE.